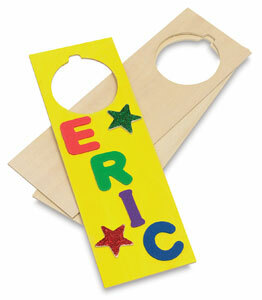 Children like personalized items. They'll enjoy decorating these door hangers for themselves, or as gifts, with paint, glitter, felt, or foam letters and numbers, plastic gems ... whatever! They provide a pre-cut hole for hanging on a doorknob. The unfinished wood is ready to paint and decorate. Each door hanger measures 9½" H × 3¾" W (24 cm × 10 cm).